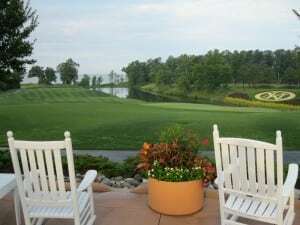 The Kingsmill Resort and Spa in Williamsburg, Virginia is truly the king of resorts. The River Course is a favorite of many LPGA and PGA players. Pete Dye’s design has several tunnels connecting the holes, but don’t get tunnel vision, because you will miss the incredible beauty of this green canvas, splattered with red cardinals, bluebirds, and pink azaleas. Stately brick homes watch over some fairways, while the waterways are guarded by loggerheads and snakes making wakes. A hillside cannon above the river on 16, is a bold reminder of the rich regional history. It leads to the signature hole 17, marking Burwell’s landing since 1775, where the British were held off and the confederates later occupied. 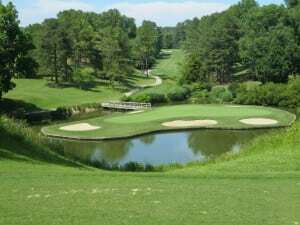 The Woods Course at Kingsmill is pure golf, co-designed by architect Tom Clark and Curtis Strange. Absent of houses, rustic bridges over the Audubon sanctuary, traverse the ravines. The Plantation Course by Arnold Palmer offers generous fairways and rolling greens. The Bray Links is one of the prettiest 9 hole par 3s on the planet, with plenty of river views. It is a great practice run for the avid golfer or fun outing for the entire family. The world class spa delivers a massage after play or a sundry of other treatments. But wait, that’s not all -a tennis club, great restaurants and even a marina with a sandy beach, and assorted activities round out the resort. Kingsmill is so complete, you won’t want to leave, however Williamsburg has too many options not to explore. The Colonial section is rich in history, with an abundance of shopping and culinary choices. Virginia may be synonymous with taverns, so you have to check one out. We highly recommend The King’s Arm Tavern for an authentic colonial dining experience complete with the garb of the ages, over sized napkins to tuck in your neck, singing balladeers and wonderful food. Established in 1772, this is where our forefathers gathered for open debate, when “politically incorrect” would have been an oxymoron. If those walls could talk! When leaving, the Maitre d’ kindly informed us that since our journey to New York would be a long one, they had “given our horses extra feed and water”. All of Colonial Williamsburg is a stage to savor and applaud. In the center of the colonial section, near the William and Mary Campus, is the Golden Horseshoe Golf Club, with the first island green in America. The fish were jumping, a swan swimming as an osprey soared in the air, and a blue crane glided by. Next to the ladies tee box, a water moccasin was slithering in the reeds. That is just one hole! Set on 125 acres, this tight and gorgeous course is all fun and games until the “terrifying finishing hole” as proclaimed in the yardage book. While Williamsburg’s beauty is engulfed by trees, the roadways lead to countless shores. Follow the Colonial Parkway to the York River passing under bridges from the 1700s. Drive slowly and take in the views, since a speeding ticket there constitutes a federal offense. There is a lovely beach under the Coleman Memorial Bridge, fresh oysters from the Chesapeake Bay and the Road to Revolution in Yorktown. Amidst the history, find modern adventure. If you ever fear you’re getting “too old”, and are not sure you should ride roller coasters anymore, the best thing to do is head to Busch Gardens. After an enlightening backstage tour that ens ured our ultimate safety (except from heart failure), we hopped on the Loch Ness Monster for a slow ride up, smooth jerk into gear and a long winding, upside down thrill of a ride back into the station, mouths wide open, screaming , laughing and tearing at the same time. We went right to the head of the line of the Curse of Darkastle next and the Griffon after that, culminating with the Alpengeist before starting on a 10 hour drive home during which our abs still reeled. Giddy and alive, we reconfirmed, we still got it after all! With over 50 rides, and animal attractions, this 100 acres of European exploration through lush gardens, has been voted the most beautiful park for 19 years. Williamsburg delivers it all. Herald the history buff to read the facts on plaques at every turn. Visualize the early politicos and hear their cries. As for this couple of travelers, give us golf or give us spa.